In our previous article, we have learned about “How to interface GPS module with Computer and How to make a GPS updated Clock”. In this project we are going one step ahead with GPS and going to track a vehicle using GPS and GSM. This Vehicle Tracking System can also be used for Accident Detection Alert System, Soldier Tracking System and many more, by just making few changes in hardware and software. Tracking of vehicle is a process in which we track the vehicle location in form of Latitude and Longitude (GPS coordinates). GPS Coordinates are the value of a location. This system is very efficient for outdoor application purpose. This kind of Vehicle Tracking System Project is widely in tracking Cabs/Taxis, stolen vehicles, school/colleges buses etc. GPS stands for Global Positioning System and used to detect the Latitude and Longitude of any location on the Earth, with exact UTC time (Universal Time Coordinated). GPS module is the main component in our vehicle tracking system project. This device receives the coordinates from the satellite for each and every second, with time and date. GPS module sends the data related to tracking position in real time, and it sends so many data in NMEA format (see the screenshot below). NMEA format consist several sentences, in which we only need one sentence. This sentence starts from $GPGGA and contains the coordinates, time and other useful information. This GPGGA is referred to Global Positioning System Fix Data. Know more about Reading GPS data and its strings here. We can extract coordinate from $GPGGA string by counting the commas in the string. Suppose you find $GPGGA string and stores it in an array, then Latitude can be found after two commas and Longitude can be found after four commas. Now these latitude and longitude can be put in other arrays. Circuit Connections of this Vehicle Tracking System Project is simple. Here Tx pin of GPS module is directly connected to digital pin number 10 of Arduino. By using Software Serial Library here, we have allowed serial communication on pin 10 and 11, and made them Rx and Tx respectively and left the Rx pin of GPS Module open. By default Pin 0 and 1 of Arduino are used for serial communication but by using SoftwareSerial library, we can allow serial communication on other digital pins of the Arduino. 12 Volt supply is used to power the GPS Module. GSM module’s Tx and Rx pins of are directly connected to pin Rx and Tx of Arduino. GSM module is also powered by 12v supply. An optional LCD’s data pins D4, D5, D6 and D7 are connected to pin number 5, 4, 3, and 2 of Arduino. Command pin RS and EN of LCD are connected with pin number 2 and 3 of Arduino and RW pin is directly connected with ground. A Potentiometer is also used for setting contrast or brightness of LCD. In this project, Arduino is used for controlling whole the process with a GPS Receiver and GSM module. GPS Receiver is used for detecting coordinates of the vehicle, GSM module is used for sending the coordinates to user by SMS. And an optional 16x2 LCD is also used for displaying status messages or coordinates. We have used GPS Module SKG13BL and GSM Module SIM900A. 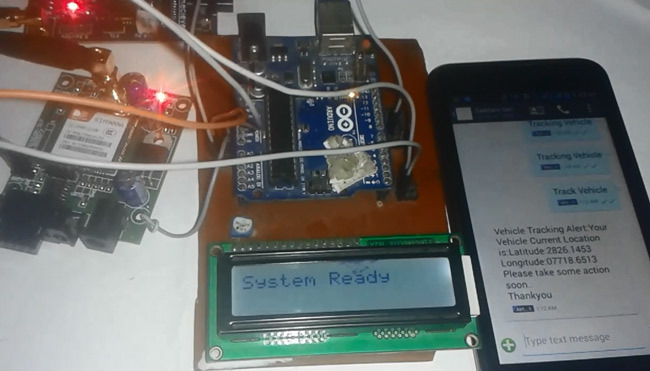 Sent message is received by GSM module which is connected to the system and sends message data to Arduino. Arduino reads it and extract main message from the whole message. And then compare it with predefined message in Arduino. If any match occurs then Arduino reads coordinates by extracting $GPGGA String from GPS module data (GPS working explained above) and send it to user by using GSM module. This message contains the coordinates of vehicle location. In programming part first we include libraries and define pins for LCD & software serial communication. Also define some variable with arrays for storing data. Software Serial Library is used to allow serial communication on pin 10 and 11. Here array str is used for storing received message from GSM module and gpsString is used for storing GPS string. char *test=”$GPGGA” is used to compare the right string that we need for coordinates. After it we have initialized serial communication, LCD, GSM & GPS module in setup function and showed a welcome message on LCD. In loop function we receive message and GPS string. Functions void init_sms and void send_sms() are used to initialising and sending message. Use proper 10 digit Cell phone no, in init_sms function. Function void get_gps() has been used to extract the coordinates from the received string. Function void gpsEvent() is used for receiving GPS data into the Arduino. Function void serialEvent() is used for receiving message from GSM and comparing the received message with predefined message (Track Vehicle). Initialization function ‘gsm_init()’ is used for initialising and configuring the GSM Module, where firstly, GSM module is checked whether it is connected or not by sending ‘AT’ command to GSM module. If response OK is received, means it is ready. System keeps checking for the module until it becomes ready or until ‘OK’ is received. Then ECHO is turned off by sending the ATE0 command, otherwise GSM module will echo all the commands. Then finally Network availability is checked through the ‘AT+CPIN?’ command, if inserted card is SIM card and PIN is present, it gives the response +CPIN: READY. This is also check repeatedly until the network is found. This can be clearly understood by the Video below. Check all the above functions in Code Section below. how to simulate this design in proteus? Thank you for this post. I have make it . Everything is going well except one thing. The massage "NO GPS range" is stuck on the lcd. I am using Ublox neo 7m GPS module with compass. No GPS Range Means your GPS is not in getting signal from satellite. you have to place your GPS receiver or GPS antenna outdoor(on the roof, window)..
Is it necessary that we use the same gps module specified by you?or can we use any other gps available in the market? Hi, im in school project, and i need to get de gps cordenates and send it to a cellphone, im useing, de arduino uno and the SIM808 module, and my question is, how to use this module, is too hard to found examples of code with this module. thanks! GSM part is working fine but its GPS power is not turning on by the command. and command give a error. which gsm and gps module buy? @Darshan @nikhil: We have used GPS Module SKG13BL and GSM Module SIM900A, it is already mentioned. Do you need a data plan for the GPS to get the coordinates? or an internet access of some sorts? Am using arduino uno and NEO-6m-0-001 (Gps) does this codes work for these models ? Yes, it should work. Check the Tx, Rx and other pins of your model and connect accordingly. After configuration of everything my LCD only displays "Vehicle Tracking System "
Hi. I have tried out this project with sim800l. The lcd works properly and displays that 'network has been found' plus the 'longitude' and 'latitude'. But when I send the text Track Vehicle, I get no reply. Can you please help me to solve this??? My LCD keeps displaying Finding Module............. and doesn't go beyond that , what is the Problem actually ? My GSM Module doesn't Give the response to the AT commands sent so I keep seeing ATATATATATATATA....... on my Serial monitor so I was asking whats wrong ?, is it the codes or the connection that has a problem ? later the code isn't uploading to the ardino board! (avrdude..error relating to port 0)...Could you please tell the changes to be made in the code and the circuit connections. But the lcd stil does not display Message Received nor gsm sending any text to my phone. What else can I try? Anybody who can help me solve this problem??? #Amir Said thank you for your reply. I managed to receive the message after increasing the voltage. @Elvin and @Amir : Glad to know, that you finally resolved your issues with the Project. Guys does anyone know how to change the code so as to receive the longitude and latitude data in degrees format alone without the minutes? You can easily do with some programming like using 'round' function round(longitude/100) or by applying some other logic to extract the first two digits (degrees). in the same project i dont want LCD display . i want the latitude and longitude once in 5minutes periodically ,please help me to finish my project. I have these errors, can you please resolve them. I have used the same code as define by the author. my lcd stops on finding module..
after powering the sim800l with 3.7volt lithium battery,i was able to dial the number in the module and its rings.but when i send message(Track Vehicle) to the module,it only receive the message but nothing was sent back to the number i put in the programming...pls how to i test if a sim800l is working with sms recieving and sending sms using arduino...please urgent feedback is needed..
hardware: gps:NEO-6m-0-001 (Gps), and arduino(any type)....make sure your the gps TX is connected to pin10 of the arduino and the RX is left unconnected.... gsm sim800l...i power my sim800l with a full charger power bank battery......Lithium Ion 18600 3.7v Battery... since the sim800l data sheet says it need power of 3.7v-4.2volt and draw current of up to 2A.. after all connection are done.here is the code i used..
Arduino: 1.8.1 (Windows XP), Board: "Arduino/Genuino Uno"
Sketch uses 8162 bytes (25%) of program storage space. Maximum is 32256 bytes. Global variables use 1003 bytes (48%) of dynamic memory, leaving 1045 bytes for local variables. Maximum is 2048 bytes. I need a code of gps and gsm in which the data of gps is send to the mobile number through gsm continously. thanks to admin for the great work being done..
Glad to know that your setup finally worked! hi everyone. please is it possible to make the reply message to your phone a link to google maps showing the location of the car? if possible please how? thanks a lot. Try using the code provided by user 'salufu' in above comments, he has successfully done it. hello , can i use other gps module ? anyone ? Yes, check the datasheet of your GPS before connecting it. sir i have a problem with it . it does'nt work its stuck in (system ready) and can't get any thing out of it . when i send (Track Vehicle ) nothing happen could u pls help me with it iam using the same code , sim900 and also what does echo mean ? Check your connections and code again. Further echo is disabled otherwise it will print all the given AT commands on serial monitor. You dont need to install any Library for GSM, we just need to serially send and receive the data from the GSM module using the Rx and Tx pin. Further SoftwareSerial.h library is enough to change the Default Rx Tx pins of Arduino, which we have used. 1. In my GPRS Shield SIM900 there is a in built antenna, what's the purpose of the antenna? 2. is it nesessary to add a GPS module for this project?, if so please recommend a suitable one? 3. But in my Shield i don't have no idea where to plug the GPS module? Antenna is there in all the GSM modules, and you can use any GPS module or can use GPS Module SKG13 which we have used in this project. hello.....anyone can help me to do this project for my final year project? i have my final project. I used SIM800 and my gps is Skylab SKG25B . does it work for the same circuit and codes?.